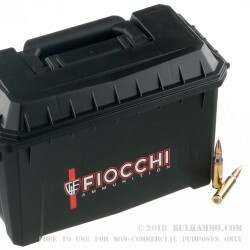 A high quality imported round by Fiocchi for the .308 Winchester, in a value added package including a plastic ammo can. 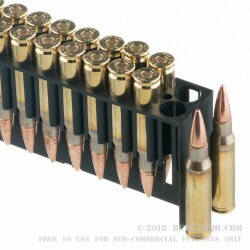 The 180 round case load is very competitively priced for a FMJ brass cartridge case with a boxer primer that’s capable of shooting sub MOA. This is just a great all around bargain shooting ammunition for sighting In your favorite rifle or for shooting targets out to 300 yards. With sub 1 MOA accuracy capable, this flat shooting value priced .308 ammunition should easily become a stable presence on your ammo shelf. 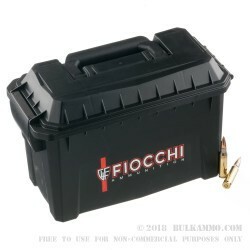 The price per shot for ammunition of this quality is hard to beat and the value add of reloadable brass, a FREE ammo box and such clean manufacture quality, makes Fiocchi’s .308 150 grain load a powerhouse among peers. Reliability and consistency is something shooters whoa re new to Fiocchi’s different ammunition lines are starting to realize is simply part of Fiocchi’s DNA. They are a legacy European producer of quality ammunition and for decades, have been producing low cost ammunition for the American Market. This is another winning load among Fiocchi’s offerings in the USA, for the USA shooter. Suitable for use in any .308 Winchester rifle. 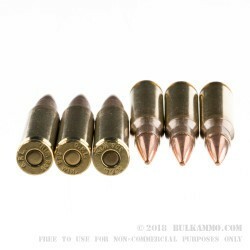 A: Hello Will, This ammunition is loaded with a standard lead core, copper jacketed projectile. According to Fiocchi, this round does not contain any steel and will have no issues passing a magnet test.